Why indeed. He might think it’s about trust; did I trust the ex-therapist completely, to the point where I surrendered everything to him? Arguably so, I suppose, and I can see why that would offend my current therapist – or at least cause him to wonder if we really have the rapport we seem to. I see it differently, of course, but he always accuses me of trying to rationalise or find reasons for things rather than just feel, and this could be one such occasion. Who knows. One thing my therapist and I will never agree on is the role of psychiatry in the management of conditions like mine. One of the reasons, in my view, that my therapist has never seen any psychotic episodes in his time with me is simply that medication has fended them off. He regards such an explanation as a cop-out, rather than something that might actually be the bloody reality, which is immensely frustrating at times. To me, in general terms anyway, he treats my PTSD; my psychiatrist treats my bipolar/schizoaffective disorder. I view them very much as discreet, separate issues, though of course I accept that the causes and treatments for such ‘disorders’ are complex, varied and deeply individual. And herein, finally, lies what I’m attempting to get at with this post. What is psychosis, and what is dissociation? Are they one and the same, as he appears to see it? Or are they different manifestations of different types of mental health condition? 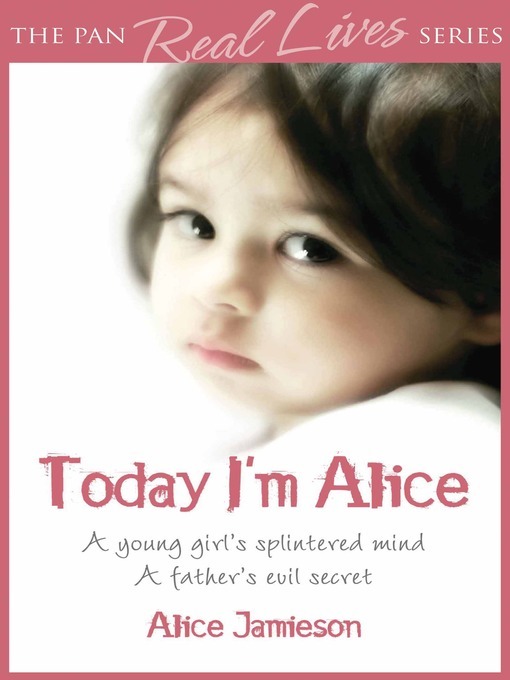 I’ve been reading a book called Today I’m Alice, which is about a woman who experienced psychosis in the wake of severe trauma. I read it, and thought of you throughout. I listened to him describing the book, and found myself somewhat bewildered. He was clearly describing a book about dissociative identity disorder, not psychosis. I mean, it even says it’s about DID(/MPD) on the front of the damn thing! Now, I can see why some would be confused by the distinction. If alters/parts are talking to you, and you’re not aware of them as individuals sharing your body or of the fact that multiples even exist (and I’m guessing that many not already immersed in this online world of crazy people don’t), then assuming you had schizophrenia or similar might seem like a logical conclusion. I can even see why it would be difficult for a psychiatrist to arrive at the correct diagnosis. Still, these conditions are not the same, whatever popular opinion and the media may erroneously suggest. For my therapist, a man who has worked with both psychotic and dissociative patients and who is about as close to an expert in this arena as I’ve met, to equate them is astonishing. He would argue that he sees all mental health conditions as existing on a trauma-based continuum and, although I don’t agree with that model, I can see the arguments that give rise to it. But why does that have to mean that psychosis and dissociation are virtually identical sides of the same coin? The ‘hearing voices’ thing is at the crux of Today I’m Alice, my therapist’s discussion of which prompted this post. If we assume for a second that the possible alter I mentioned in the last paragraph actually was an alter (again, I don’t think so), then the experience is very different. Your mind clouds, and it feels like someone is ‘pushing in’ to your consciousness. Any words are heard from that pushed area – not your own, but very definitely right there, in your head. And my experience was that they, however alien, came from somewhere. Of course, there’s more to both psychosis and dissociation than voices. I’ve had genuinely amnesiac episodes of dissociation – the horrible realisation that you’ve just woken up, but not in your bed. Oh no. You’re alone in your car, well on the other side of town, your last memory being joining the motorway maybe 40 minutes ago (that’s a good bit more than highway hypnosis, before someone suggests it!) Does one suffer from amnesia during a psychosis? I suppose there’s no reason why not – indeed, the psychosis itself may be traumatic enough to cause memory loss – but I don’t think it comes as part of the deal per se. Derealisation and depersonalisation are types of dissociation which, respectively, involve a sense of ‘unreality’ about the world around you, and about yourself. Both, in my experience, are like looking at things though a figurative veil. The world, your body, whatever…they don’t seem real. They’re strange and alien, and you feel like you exist in a bizarre fog that keeps you two steps away from reclaiming them as legitimate parts of your life. The operative clause in the above paragraph is they don’t seem real. Note the use of the word ‘seem’. You’re highly disconnected from things when depersonalised or derealised, but much as things don’t seem real, you retain an awareness that, on some objective level, they are. And then we have delusions. Beliefs that are false and often fantastical. I don’t recall having experienced this as a by-product of dissociation at any point; as I noted above, when in a dissociated state (one that you remember, anyway), you still retain some semblane of knowledge of objective reality. If you’re delusional, almost by definition, you don’t. If the sign is there to send surreptitious messages to you, then let me assure you that it is. You – or those around you – can rationalise that all you like, but regardless of the objectivity and logic of any counter-argument, for as long as the delusion lasts you truly believe that it is real. Anyone saying otherwise simply isn’t in on the joke; all you can do is humour their delusion that the sign isn’t an instrument of psychic communication. Poor sods, you might think, missing out on the fun. So. What am I saying, ultimately? My therapist contends that dissociation and psychosis are borne of the same thing. As noted way up above, although I disagree, I can see that there’s an argument to be made there – that the trauma-model is certainly worthy of discussion as a possible contributor to, potentially, all mental illnesses. However, regardless of what causes psychosis and dissociation, the actual experience of the two phenomena are, in my experience at least, very different, and I’m rather annoyed at my therapist’s clumsy conflation of the two vis a vis Alice Jamieson’s book. But I’m just one person out of millions who has gone through one or both of these conditions. What are your experiences? Are psychosis and dissociation the same thing? How do they feel to you – in what ways are they the same, and how do they differ? Does it piss you off that they’re often considered as being the same thing (eg. the fact that most people think schizophrenia equals a ‘split’ personality), or is it fine by you? Sound off below. Enquiring minds – and this one 😉 – would love to know. 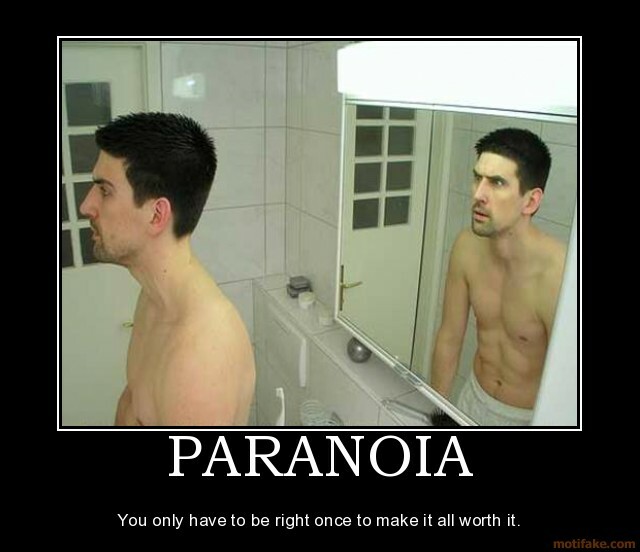 Also on the paranoid delusions, in the moment i’ve experienced them, I’ve absolutely believed them to be true, no matter how bizarre. A frustrating thing for me hasn’t necessarily been whether anyone thinks I have a split personality, or anything like that, but my frustration that I have not adequately explained how terrifying the voices were when they happened, how , when I at least experienced them I genuinely believed I was going to be murdered. Anyway, like I said really interesting and some things there I hadn’t thought about. Grr, I’d written a long reply to this, only for WordPress to go and lose it on me. A pox on modern technology! Anyway, firstly, sorry for taking so long to approve this – for some reason, it went into spam 😐 It must have been providence that urged me to check the folder because I normally don’t 😉 Glad I caught it – thanks for commenting! Yes! I completely agree. You can use all the adjectives you like – ‘petrifying’, ‘terrifying’, ‘horrific’, yakka yakka – but words never grasp it, do they? The only way anyone can ever truly get the level of sheer terror that can be involved is to experience it for themselves – and that’s not something I’d wish on anyone. The great psychiatric powers that be have told me that my experiences of Notgod are not true psychosis as a tiny bit of myself knows that they are not real. Instead they believe they are manifestations of extreme anxiety. Although why they then insist on treating them with antipsychotics is a good question. As to dissociation, they never really discuss that with me for one reason or another. Yeah, I can appreciate that for some they’re similar or at least coming from the same source. My therapist thinks that psychotic voices represent a part of one’s (sub-)consciousness that holds anger, pain and suchlike, and needs voiced, so maybe that’s the story with Notgod. It just doesn’t really ring true with my own experience. Anyway, it almost sounds as if your former therapist could have pulled out a saddle n reins for you as he’d broken you as it were. For people of questionable moral character, this is the way to go for compliance and accessing the truth. Not that I am such a person… ahem. Back to the main crux of the story, I think that your therapist is getting a little lost because it’s quite common for things to resemble each other, yet they come from entirely separate places. Take bipolar and aspergers, very similar in many ways, totally different things though. I don’t think my former therapist would have behaved…er…improperly, I suppose, but other than that – yes. It was a highly dysfunctional relationship and only ended in causing me great pain. My current therapeutic engagement has felt a lot more healthy and much less asymmetrical. To be fair to my (current) therapist, he’s really, really into this whole mental health thing, and I’m not totally convinced he’d not spot the differences between different diagnoses in general. I think it’s simply that he refuses to entertain the notion that they’re may be biopsycho elements to mental illness; it is all trauma-based to him, and therefore psychosis and dissociation don’t differ in his eyes. I actually challenged him on his equation of psychosis and dissociation in this session, and he said as much. It is weird that we can hold this mutual respect whilst holding fundamentally opposed views, but I suppose one has to recognise that all opinions are valid to their holders. I dunno, Null, have you ever spoken to your shrink about your symptoms? Some of the sleep stuff could be normal sleep-phenomena-related hallucination-type stuff, but losing time and tasting things etc sounds a little unusual. I wonder why he assumes it’s all trauma based? I contend that it’s because the cases he sees have some trauma related to them. Should this be the case then that’s like aliens assuming everyone on Earth is white, speaks with an American accent, and loves burgers because they’ve seen nothing but McDonalds ads. I contend that it’s because the cases he sees have some trauma related to them. You know, it sounds so obvious now that you’ve said it, but I hadn’t thought of that. I think you’re right. Granted, his position is one held by others too, but that could be true of them also. If that’s what he really believes, then fine – but for God’s sake, let the rest of us get on with it. That’s what I hate about the anti-psychiatry movement; its most vocal proponents are so dogmatic and judgemental. To be fair, my therapist isn’t judgemental towards me, but he will never be persuaded that there is a justifiable alternative to a complete social model of mental illness. It must be frustrating to have a therapist with such different views on medication and diagnoses (etc.) to your own. I don’t think I could handle that, personally! I personally think of dissociation and psychosis as mostly separate things, but I believe there are areas where they overlap – like many mental health symptoms. Yep, I totally agree with this. It’s a really good book. I would recommend it – though it’s also obviously quite triggering. See, that’s what I thought; isn’t it rather insulting to genuine alters – other people who share one’s body – to dismiss them as phenomena that are essentially unreal? No disrespect meant to nice voices and suchlike, but whether one realises it at the time or not, they’re simply not real. Alters are. My view is that my range of experiences from psychosis to alters/DID and an alarmingly diverse range of ‘straight’ dissociation phenomena (which include both remembered and unremembered experience), all fit under a dissociation umbrella. I’m fortunate/stubborn enough to cope with what’s happening for me without meds (but it comes at a huge cost to me and those around me). I think the codification of various disorders into discrete boxes as done by the DSM and the treatment sequelae which follow from those is inadequate as my experience as few people ‘fit’ the boxes they get put in properly, and the ‘extra’ symptoms they have (which sit with other diagnoses) get left un/inadequately treated. So I’m not sure trying to distinguish dissociation from psychosis, or identifying and then treating different alters as part of DID is actually that helpful- at heart, (and as you say) all of these symptoms are stemming from a trauma (or rather, as I see it not being just a/many trauma/s but the role it then comes to take, a key break in self integration). It might suit the particular health economy in some cultures (the US seems to have a lot of therapists who like being retained on long-term therapy required for DID, the UK seems to find it easier to dole out meds for depression or psychosis or whatever and then perhaps give some limited psychotherapy for the gaps pills don’t fill), and that’s fine as long as it suits the patient, but I’m too scared/paranoid about the limits in healthcare systems to trust that they’d provide the ongoing support necessary and I want to be able to fix my problems once and for all and get on with life. Given it sounds like I’m saying what Bourach has done, I’m equally frustrated it’s not coming across right! But without wishing to be too challenging, I think you get this too. You know the meds are stopping you revealing yourself to this therapist. Fair enough if you need them to keep you functioning, but it *is* stopping you repairing the damage which is giving rise to psychosis. (yes, there are genetic and chemical factors in psychosis, but the fact that as humans we’re able to dissociate shows these are equally genetically coded, in my view) You sound like you do need to yell at him, whether it’s for his conflation of Alice with you or just to air your existential rage. I do see what you’re saying, but I can’t agree I’m afraid – at least self-referentially. I think he might think that medication stops me from revealing all to him (thus negating his view that medication is useless, because that would prove that it does in fact do something), but I don’t see the psychosis as a representative of any of the trauma really. I think it can be – as you said it’s been the experience of both yourself and bourach – and as Songs and Sonnets pointed out, it may well have happened to Alice too. I suppose I’ve come to this conclusion because there is no correspondence between my dissociative symptoms and psychotic ones; it doesn’t feel continuum-based for me in the way others feel it does for them. I do agree that there is a lot of overlap in mental health disorders, meaning that the DSM and relevant section of the ICD should only ever serve as guides, rather than gospels to live by. Indeed, I can see the ‘Big Pharma’ arguments, especially with reference to the USA. Still, I find broad classifications useful, for guidance purposes if nothing else. And guidance can inform treatment – on those occasions when the professionals bother to practice what they preach. Whether the inadequacy of treatment is institutional failure or down to the uselessness of individuals, I’ve yet o make up my mind. You sound like you do need to yell at him, whether it’s for his conflation of Alice with you or just to air your existential rage. Very interesting analysis as always. I really can’t speak from personal experience as to the best of my knowledge I have never suffered from psychosiss or dissocation- however my sister has had dissociatve experiences and I’ve seen her go through them. I guess I see that- and my own depression- as caused by what we went through as kids, we were quite badly physically and emotionally abused by our father and although our mother was loving she was too scared of my dad to leave him or properly stand up to him. My sis is younger than me and sort of felt it harder I suppose, I think that’s probably why she developed borderline whereas I “just” ended up with depression. _But_ that said I have a very close friend who has bipolar disorder- unlike you she doesn’t have psychosis though- and she has _no_ trauma in her background (beyond “normal” things we all go through such as loss of grandparents). Her mother and her mother’s neice both have mental health probs and my friend is as sure as she can be that they have no trauma either. So I guess I mean that the cause depends on the person like you’ve said here. Trauma can cause mental health probs but so can other things, so can a mix, whatever- to totally dismiss psychiatrists and meds seems a bit short-sighted. Thanks Kate 🙂 Basically, I agree with everything you’ve said. There’s no doubt that trauma has a role to play in many mental health concerns, and even the traditionally “organic” illnesses may well have a trauma element to them too. Even where trauma is the primary antagonist, it doesn’t necessarily mean that medication and psychiatric intervention is bad – granted, without therapy, it’s rather palliative, but still not without merit. I know I’ve always found that there is simply no way I could have got through the worst periods of therapy without medication, regardless of whether I have PTSD, bipolar, schizophrenia, or some mishmash of them all. I know I’ve said this before, but for what it’s worth I am so sorry that you were treated as you were by your father 😦 No one, especially not a kid, should have to ever go through that. Having been on Twitter since 2008 or something and having met a number of people who’ve had horribly abusive childhoods, very little surprises me any more – but I still despair that the people who would do this truly exist. Bastards. Anyway, thanks again Kate, and I hope things are well with you. hi karen. I have never been psychosis but I have did and what i’ve been thru sound really different from that. my parts do sometimes just appear in my head but they always feel pat of me and never feel like their unreal or just random. I am just getting to know sum of them granted but they’re all in my head so to speakso it is different. i see what you’re therapist is getting at to be fair but still think the 2 things are very separate. I understand what you mean – well, I can’t, obviously, since I don’t have DID, but I know what you’re getting at 🙂 In a sense I can understand how voices can present confusion both for the person experiencing them and for a therapist/psychiatrist/whatever because the distinction, while definite, is somewhat ineffable (thus the rambling nature of the above post!) But still, an experienced mental health worker should be able to tell the difference over time, and whilst I don’t want to speak for people with DID or other forms of dissociation, I’d imagine (at least based on these comments) that the diagnosis of a psychotic disorder just can’t ‘sit’ with people with DID. Those ‘voices’ are real. Anyway, I really ought to stop blathering on 😉 Thanks Sarah, and take care. As someone who has experienced both severe dissociation (DID) and psychosis (thanks bipolar) I absolutely think that they are different things. Not that you can’t have both at the same time of course but that they are different things. Like you said, I’ve had the auditory hallucinations, I’ve had visual hallucinations…that’s usually how I know I’m having a psychotic episode. Those perceptions are very different than the inner voices and thoughts I “hear” based on DID. With dissociation my therapist pointed out to me long ago that there is a spectrum. People can experience different types of dissociation at varying severities along that spectrum. So, a person can dissociate but not have DID. That doesn’t minimize the fact that they experienced dissociation. I also tend to think that certain things are more biological and others are trauma-based. For instance, bipolar disorder (amongst other illnesses) runs in my family. Biology. But things like dissociation and PTSD are trauma-based. Hmmm…what was my point? I have no idea lol. Jeez, I guess I’ll leave it there. This is very interesting. I have never experienced psychosis and I do not have DID, but I do dissociate (more in the C-PTSD range) and I can share a few more experiences. I will experience an overlay of another size of body that would correspond to the same age range of whatever part has been triggered. I will sometimes say things out loud, but “I” didn’t really say them. I can feel a child part come and sit on my lap, in order to be soothed (the concept of me comforting myself still strikes me as odd sometimes.) I have had mental impressions of the appearance of my child parts (meaning that the most salient features aren’t normal physical characteristics, but rather things like being filthy, bloody, hiding in a corner, etc..) At times I am aware of a child part having a different emotional reaction to something than I am. At the same time, I am extremely aware that these child parts are all *me*. They do not have the separateness of having their own personalities. They are essentially, but not entirely, memory states. In essence they are only 2 dimensional, rather than 3D.